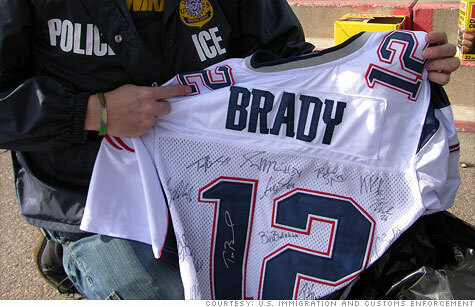 Counterfeit jerseys, like this one seized before Super Bowl XLII in Glendale, Ariz., usually sell for up to $80. But phony player signatures often raise the value substantially. NEW YORK (CNNMoney) -- While the Giants and Patriots gear up for the rematch of a lifetime, Super Bowl XLV, federal agents are preparing for one of the biggest sports-related counterfeit busts ever. U.S. Immigration and Customs Enforcement and other federal agencies seized a record $3.56 million worth of fake Super Bowl-related memorabilia during "Operation Interception" last year. This year, agents expect another major haul, especially given the extreme popularity of the two teams, according to Ross Feinstein, a spokesman for ICE. "We'll see numerous counterfeit jerseys, sweatshirts, hats, cell phone covers," he said. "If they can make it, we'll seize it." Anything with the Super Bowl logo that features both teams will be particularly popular, he added. Last year, over 15,000 counterfeit NFL jerseys alone were seized in the days ahead of Super Bowl Sunday. Sports fans should watch out for telltale signs like poor stitching, substandard materials or inferior packaging and, of course, a too-good-to-be-true price. Official NFL jerseys cost upwards of $80 each, says Feinstein, "if you're getting it for $30, it's a counterfeit." He also cautions against buying goods sold out of cars, on street corners, at flea markets or discount stores. And when ordering online, look out for websites using inaccurate grammar, misspellings and lacking contact information. Instead, go to the manufacturer's site and look for authorized retailers like NFL.com, he said. For those hoping to get into the big game, fake Super Bowl tickets are especially big problem, according to Jeff Grass, CEO of buysafe, an online secure transaction provider. "When there are high-dollar tickets for sale and a great deal of demand, that tends to bring out the fraudsters," he said. To avoid getting denied at the gate with a fake ticket, consumers should only buy tickets from well-established secondary market sites such as StubHub or Ticketmaster's TicketExchange (where tickets for Super Bowl XLV are currently available for anywhere from $2,600 to $14,200 apiece). These sites offer consumers protections like a money-back guarantee in the event that things go wrong. "What somebody should not do is respond to a Craigslist ad," said Grass. Of course, the best way to ensure you are buying official tickets or sports gear, in general, is to buy directly from the team or league sites, said Katherine Hutt, a spokesperson for the Council of Better Business Bureaus. "If you love your team, don't buy a hat or jersey from someone who has stolen the team's name and logo for their own profit," added Hutt. Those who pirate copyrighted material and produce counterfeit trademarked goods threaten legitimate American business, cost jobs and undermine the U.S. economy, the ICE says. Over the past four Super Bowls combined, the crackdown on contraband has resulted in the seizure of more than 66,000 counterfeit items worth $6.36 million, which is just a fraction of the total value of counterfeit goods sold in this country. In 2011 alone, $178.9 million worth of counterfeit and pirated goods were seized, according to ICE.